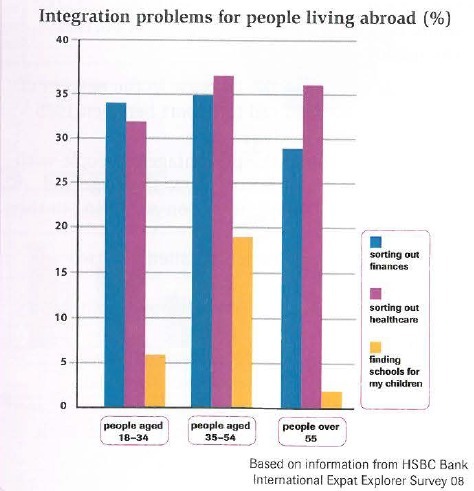 A comparison of the percentage of kind difficulties for people who move to other countries according to people's ages is shown in this bar chart. Overall, persons in middle age have most problematic in a new country, while finding schools for children become the lowest percentage of problem than others for all aged. The problem of accomplishing finance is the highest percentage for people aged 18-34. There is a slight increased of this problem proportion in people aged 35-54 to 35%. For oldest people, it decreased suddenly to under 30%. The completing health care becomes a problem for 33% in early aged. However, it is the greatest problem for people in middle aged and over 55, more than 35% for both. The proportion of problem of finding schools for children is more than 5% for young people. There was a dramatic increase of this problem in people aged 35-54 to 17%. Then, for elderly people, this problem becomes the less with small number only 2%. Here's my analysis of your report summary. I hope you can follow through. - A comparison of the information about the percentage of various kind of difficulties for people (...) according to people's agesthree different age groups is shown in thisthe bar chart. - Overall, it can be seen that persons in middle age group have the most problematic problem in a new country (...) percentage of problem than others for all agedother age groups . As you can see, the third paragraph of your essay also has the same problem. If you don't serve up the information from the chart in the proper way within the essay, you will badly damage your final grade in the essay. Therefore, avoiding this mistake in the next practice would be beneficial towards the development of your writing later on. Here are my suggestion for you! Making a shopping list in your essay will make your score lower than it should be. As for me, it is better for you to seek language of comparison and language of change. To make it simple, then you can write just only two paragraph about it. - It is better to make two sentences in the overview. do not explain the lowest number in the overview. - do not explain all the numbers, try to do grouping so you can give a clear explanation.